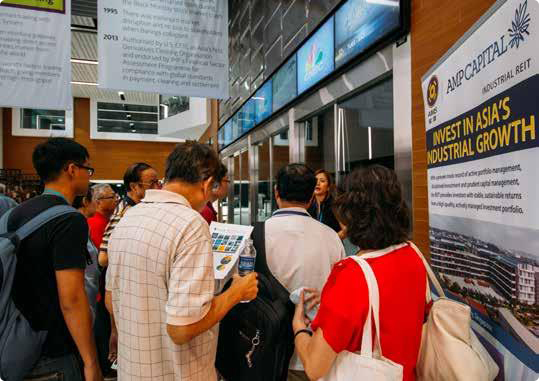 In 2016, the Singapore Exchange Securities Trading Limited (“SGX-ST”) introduced sustainability reporting on a “comply or explain” basis for all SGX-listed companies. Sustainability reporting will become mandatory for AIMS APAC REIT (“AA REIT”) with effect from the financial year ending 31 March 2018. AA REIT is pleased to present its inaugural Sustainability Report (the “Report”) for the financial year ended 31 March 2017 (“FY2017”), a year ahead of the mandated deadline. The Report is in accordance with Global Reporting Initiative (“GRI”) G4 guidelines – core option that contains the key materiality issues identified through materiality assessment and will be produced annually. 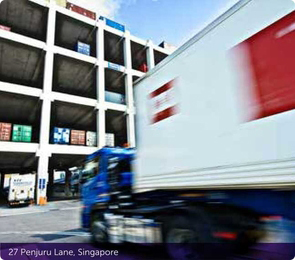 As part of our commitment, AA REIT has engaged the services of Deloitte & Touche Enterprise Risk Services Pte Ltd to advise AA REIT in its preparation of the Report. review, report and continuously strive to improve sustainability performance. Sustainability is managed across the business through relevant policies, programmes and operating procedures that are in place. 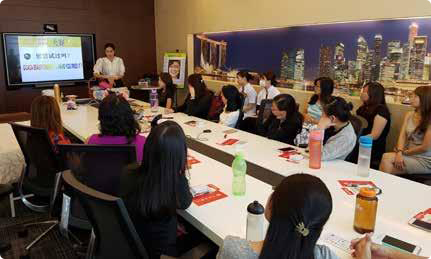 These are shared with all employees of AIMS APAC REIT MANAGEMENT LIMITED (the “Manager”), manager of AA REIT, supported with training and well-defined roles and responsibilities. This guides the management of the Manager (“Management”) on its decision-making processes and ensures that we continually deliver on our business principles across all of our operations. We employ a risk-based management approach. 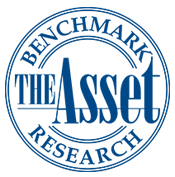 This involves reviewing our policies periodically, adjusting how we work in the event of any breach, and reporting compliance levels. We believe that to meet our sustainability goals and live by our values we need to integrate best practices into our day-to-day operations. For a start, we are tracking the energy consumption of our properties which we have direct operational control, and are considering putting in place tracking mechanisms for water usage and waste management. Our aim is to contribute to local economies where we have a presence as well as to create a workplace that brings out the best in our employees. Most importantly, we want to build a sustainable business based on trust. The Manager is committed to integrating positive sustainability practices into our working environment and business processes. This is essential in order to deliver value to our business partners, foster trust with our communities, and ensure transparency and sustainable growth for our investors. overseeing the preparation of sustainability disclosures as required by laws and/or rules, and recommending to the Board for approval. setting goals and objectives for OHS policies, programmes and practices. The scope of this Report covers all properties owned by AA REIT, its subsidiaries and joint venture. 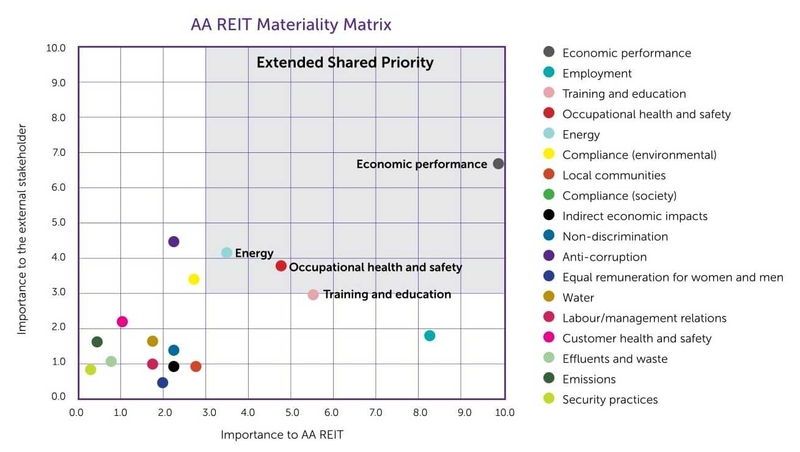 In defining the Report's content and the aspect boundaries, AA REIT considered the principles of materiality, stakeholder inclusiveness, sustainability context, and completeness. In determining the materiality factors, AA REIT has engaged key stakeholders through various channels, including formalised surveys. The sustainability concerns from the various stakeholders were then consolidated and prioritised into a materiality matrix. Refer to the stakeholder engagement table and materiality matrix further below. This Report covers the environmental, social and governance performance of AA REIT. In relation to tracking energy performance, the data presented relates only to the common areas in AA REIT’s multi-tenanted properties, where the Manager of AA REIT has the ability to monitor and influence energy efficiency. other policies and procedures adopted by AA REIT, which can be found in the corporate governance section. Accordingly, we have developed and adopted a range of corporate policies and internal controls that support the Board and Management. These policies and controls cover matters such as personal data protection, anti- money laundering and countering terrorism financing, conflicts of interest, business continuity, insider dealing, enterprise risk management, and outsourcing. AA REIT recognises the UN Global Compact Ten Principles and is considering the adoption of other social and environment charters in the future. We believe in the importance of ensuring appropriate sustainability measures are in place across our value chain. This includes appropriate risk management procedures for outsourcing and procurement. Moving forward, where possible, environmental considerations such as the level of green features in asset enhancement initiatives will be assessed. AA REIT is proud to publish the Report for FY2017, which is also AA REIT’s inaugural Sustainability Report. The Report, prepared in accordance with GRI G4 Guidelines, demonstrates our commitment towards operational sustainability and corporate responsibility. 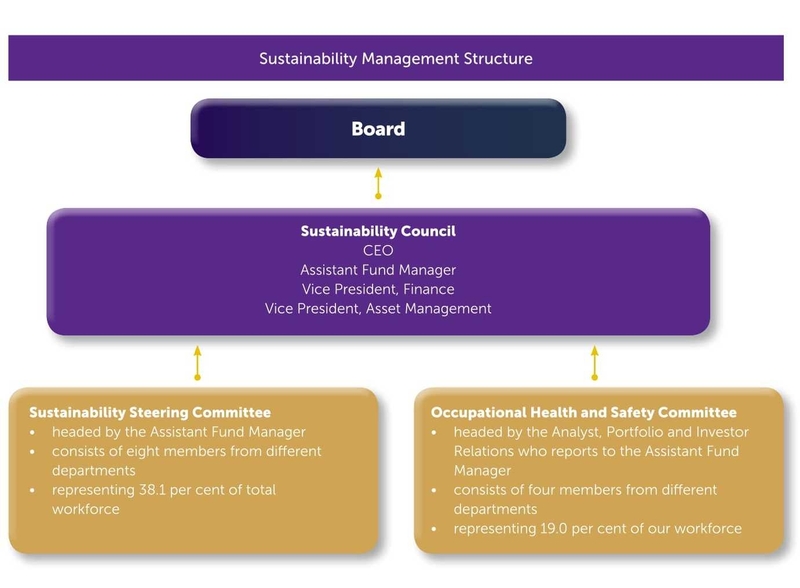 The Manager has established a Sustainability Council, which works under the guidance of the Board to ensure that sustainability measures are implemented across the business. The SC will measure and review progress towards our sustainability goals, and engage accountable stakeholders to ensure targets are met. The Manager is committed to being more environmentally conscientious by incorporating energy efficient and green initiatives into our day-to-day business operations. Initiatives include mandating Building & Construction Authority (“BCA”) Green Mark compliance for all new developments, increasing the use of e-tools to engage with stakeholders and promoting environmental stewardship. Corporate governance is at the heart of our business in achieving our sustainability goals. Building a system in which high standards are upheld and best practices are applied business-wide is essential to our successful long-term performance. We strive to maintain integrity, transparency, accountability and discipline in all our practices and have put in place a robust governance framework to ensure we meet our objectives. The Manager recognises the importance of attracting, retaining and developing a high quality workforce in order to ensure the long-term success of our business. We have invested in training employees to promote professional and personal development as well as rewarding those who uphold our values within the organisation. Looking ahead, we hope to further improve our sustainability tracking through a target based approach with clear and measurable metrics. In this Report, you will be provided with a balanced view of our position and performance with regard to some key issues and measurables. We hope you find the Report interesting and informative as we continue our sustainability journey. 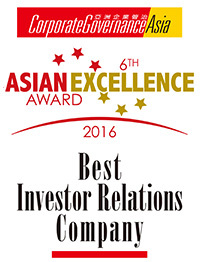 In recognition of AA REIT’s efforts in facilitating open and transparent communications with investors, media and the general investment community, AA REIT clinched the Best Investor Relations Company, awarded at the 6th Asian Excellence Awards in 2016. 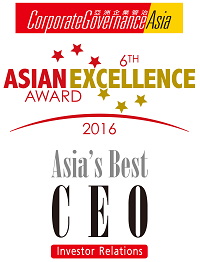 In addition, AA REIT has received Best CEO in Singapore Award for the CEO’s effort in reaching out to the investment community, which was presented during the 6th Asian Excellence Awards in 2016. In recognition of its commitment to uphold high standards of corporate governance, corporate social responsibility, environmental responsibility and investor relations, AA REIT was awarded the Titanium Award for Excellence in Governance, CSR and Investor Relations at The Asset Corporate Awards 2016. Optus Centre maintained its National Australian Built Environment Rating System (NABERS) 5 stars energy rating this year. A year ago, the rating improved to 5 stars from 4.5 stars as a result of energy efficient initiatives such as replacement of lights with LEDs in common areas. Approximately one third of AA REIT’s Singapore portfolio by net lettable area is BCA Green Mark compliant. AA REIT’s 1A International Business Park, Singapore was awarded a BCA Green Mark Gold rating and recognised by BCA as one of the Top Ten commercial buildings for governance, corporate social energy efficiency and sustainability under the ‘Private Office Buildings’ category. Refer to ‘BCA Building Energy Benchmarking Report 2016’ for more details. 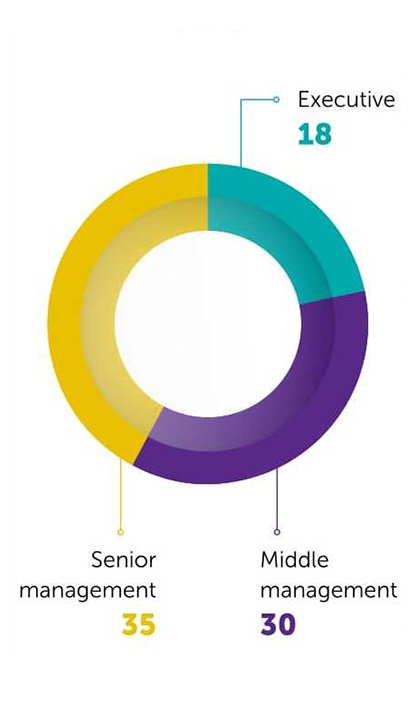 Our stakeholders are highly diverse, reflecting the breadth of our footprint within local reach of a global market. We have identified our main stakeholders groups using the GRI G4 guidelines and have put in place processes for effective communication with the key stakeholders. Based on influence, representation, responsibility, dependency and proximity, we have narrowed down seven main stakeholder groups. Understanding these key sustainability concerns are essential in building a sustainable business. The Manager is committed to promoting occupational health and safety throughout the organisation. Some of the initiatives include establishing an OHS Committee in FY2017, and providing training for employees, tenants and vendors on workplace health and safety procedures. This will help to ensure that these stakeholder groups are aware of, and comply with health and safety regulations. Employees are also expected to report hazards, unsafe work practices and accidents to the OHS Committee. This is aimed at minimising workplace injuries. The OHS Committee consists of four members from different departments. 19.0 per cent of our workforce are represented in this committee. Clear roles and responsibilities are assigned to the committee, and meetings are held at least once quarterly. Our staff gained knowledge on how to plan for their retirement and were provided with information on preparation and saving. Our staff experienced live demonstration on ‘Gua Sha’ techniques for face, acupoints and meridian lines in traditional Chinese medicine to rejuvenate oneself. In conjunction with AA REIT’s tenth year anniversary, brochures were distributed to all tenants at our properties to promote health and safety. Fruits were also given out to tenants at the property. ensure that AA REIT’s properties are equipped with automated external defibrillators. The Manager seeks to protect the wellness of our employees. The Manager recognises that staff well-being and career development are just as important to an employee as remuneration when it comes to talent retention. This can be done by creating a good working culture and nurturing a diverse work force. By developing people and giving them the right skills for growth, employees will feel empowered and valued by the company. We ensure employees achieve optimal performance through professional course and on-the-job training. We strive to create a conducive work environment through fair and competitive human resources policies, and an equitable system of recognition and rewards. Nurturing of next generation leaders and talent retention is essential for the sustainable growth of our business. 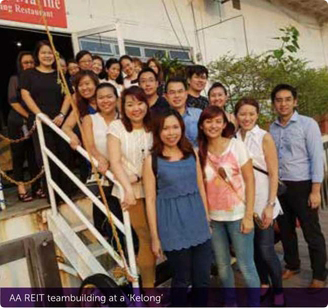 Our staff learnt about valuable guidelines and skills that are pertinent to AA REIT’s business operations. Our staff were exposed to the art of speaking with confidence. Team members shared that they found the session very useful and learnt new techniques on how to convey information in a succinct manner. Our staff had a closer look at the new lease accounting standard and its application. 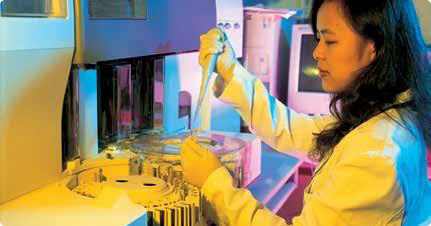 The Manager’s workforce fully consists of permanent employees located in Singapore. 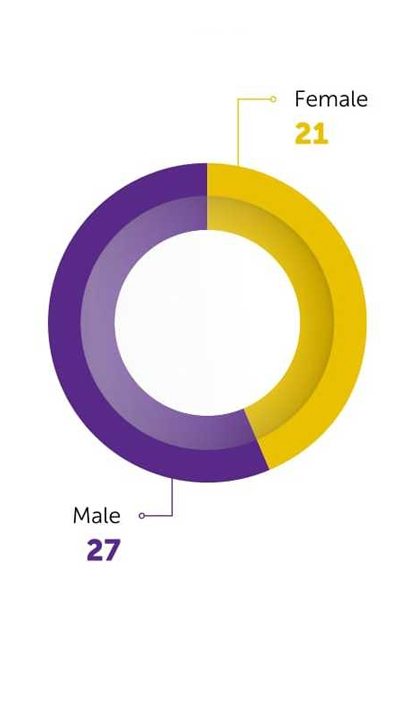 Employees have a 1:4 male to female ratio (total workforce of 21 employees), and clocked an average of 22 training hours per employee per year in FY2017. The Manager recognises that people contribute largely to the success of the business. As such, we believe in achieving high performance among our staff. Our initiatives show investments made in developing our talents through easy access to training for both genders, across all job profiles, highlighting the effort to also improve diversity in the workplace. The Manager also promotes internal collaboration through regular team workshops and teambuilding activities. For FY2018, we hope to increase the average training hours to 25 hours per employee per year. AA REIT is committed to identifying, managing and minimising the environmental impact of its business operations. The built environment accounts for a significant proportion of global energy use and greenhouse gas emissions. Energy wasted in buildings is an unnecessary cost to business and society. Therefore, we continuously seek improvements in energy efficiency by investing in innovative and practical solutions to mitigate and prevent adverse environmental impacts, while also ensuring that environmental quality considerations are incorporated in AA REIT’s daily business activities. Last but not least, stakeholders will be informed of the relevant and appropriate fact-based information about the environmental quality of AA REIT’s operations. AA REIT is focused on limiting its impact on the environment and is continuously assessing and improving its practices to incorporate green initiatives in its ordinary course of business. AA REIT has mandated that all new developments which it undertakes to be BCA Green Mark compliant. Currently, approximately one-third of AA REIT’s Singapore portfolio (by net lettable area) are BCA Green Mark compliant. Office Buildings’ category. The building uses double glazed low e-glass for curtain walls and all external windows, energy-efficient T5 light fittings, and is made up of environmentally-friendly materials with recycled content. AA REIT’s Optus Centre, Macquarie Park, New South Wales, Australia has maintained its NABERS Energy Rating of 5 stars this year. This was due to energy efficiency initiatives undertaken in FY2017, which included the continued installation of energy saving LED lights in the common areas. 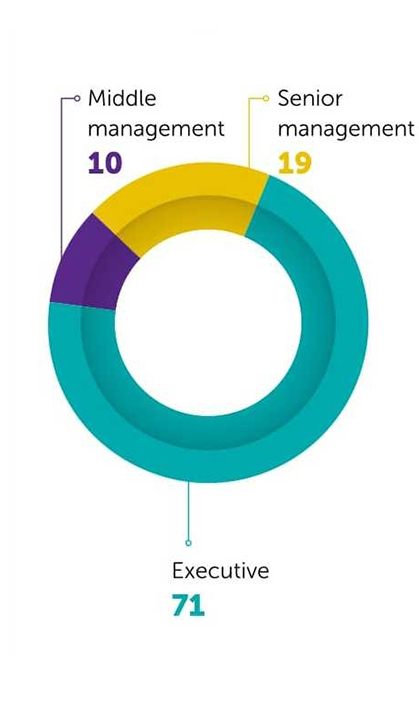 This is evident in NABERS Energy Rating’s assessment result, where Optus Centre achieved an average of second lowest rating for lighting power consumption per unit area of lettable space. Optus Centre’s chiller plants were also optimised by installing chilled water flow meters, thermal energy calculators and changing the plant programming to run the plant at its optimum load without any impact to tenants' comfort. We foresee that this optimisation will achieve 15.0 per cent to 25.0 per cent savings annually on each plant and further utility savings of 100,000 kWh for medium to large chiller plants. To further reduce our carbon footprint, AA REIT has increased its use of e-tools in stakeholder communications. Starting from last year, Unitholders were given the choice to receive their annual report in electronic version. With the majority of Unitholders adopting this option, paper usage and printing of annual reports were significantly reduced. We expect the adoption rate to further increase moving forward. Back in the office, AA REIT actively promotes environmental stewardship through good practices such as placing recycling bins in the office, using eco-friendly products and encouraging double-sided printing. Maintenance and operation of buildings is one of the highest contributors towards high energy consumption. Increase in energy emission leads to higher carbon emission as well as higher operational cost. Therefore, AA REIT is committed to implement various measure in order to minimise energy wastage and achieve cost efficiency. 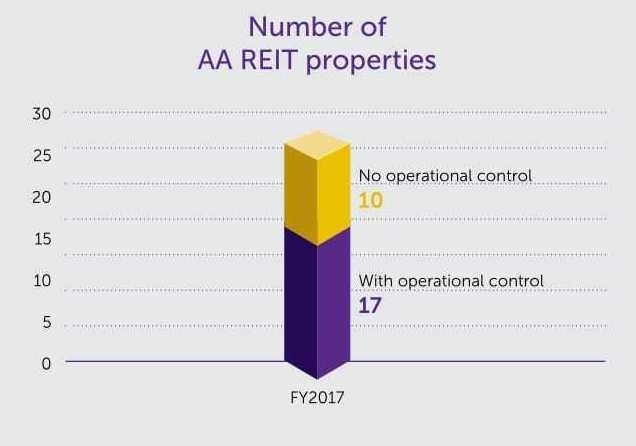 As at 31 March 2017, AA REIT had operational control over 17 of 27 properties in its portfolio. This Report details the environmental performance of those 17 properties which only covers the common areas (centralised building facilities, corridors and perimeter lighting). 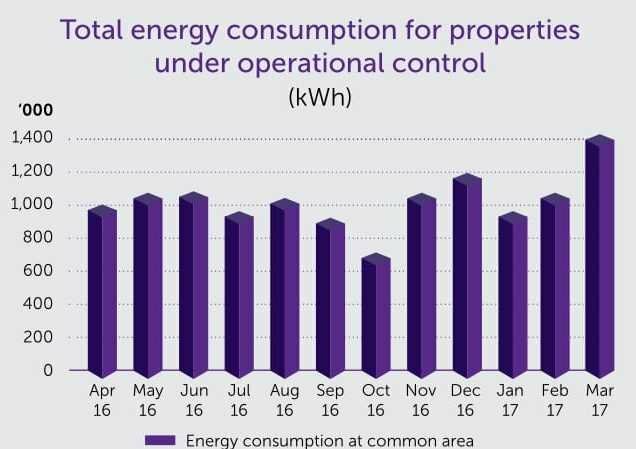 The total energy consumption for FY2017 was 11,945,641 kWh for properties in Singapore. The Manager has actively engaged with stakeholders to understand and manage potential impacts of their business operations, while breaking down the community-business barriers through impactful sustainable initiatives. We hope to instil a culture of giving and cultivate a socially responsible workforce by being socially active through our Corporate Social Responsibility (“CSR”) programmes. 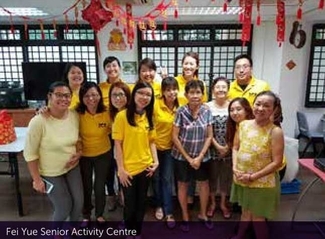 Starting from FY2017, the Manager launched its Blessed for Good (“BFG”) project where the Manager has adopted two elderly care centres namely, Fei Yue Senior Activity Centre (Holland Close) and Golden Years Centre (St Luke’s ElderCare). Under the BFG project, employees were given up to two days’ leave per year to do voluntary work in these adopted centres. For FY2018, we hope to lower the overall energy consumption with more energy efficient initiatives. On 26 August 2016, the Manager’s staff brought 25 seniors to the River Safari and on 6 January 2017, the staff visited the centre with Lunar New Year goodies and decorated the centre followed by an afternoon tea break and a game of “Bingo” with the elderly. The Manager is proud to be a partner of Fei Yue. 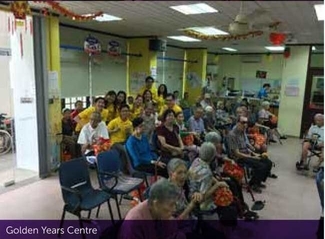 The programmes and services provided aim to improve seniors’ quality of life and prevent social isolation. On 8 September 2016, the Manager’s staff brought another 14 seniors to the River Safari and on 13 January 2017, the staff visited the centre with Lunar New Year goodies, and had an afternoon of fun and games with the elderly. The Manager is proud to be a partner of St. Luke’s ElderCare. St Luke’s ElderCare is placed in the continuum of care for the elderly between the community hospitals and homes. 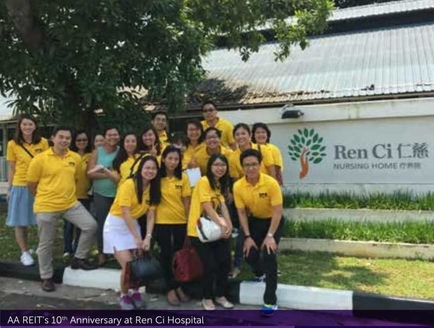 To commemorate AA REIT’s 10 th year anniversary and in conjunction with the theme of ‘Partnerships’, the Manager partnered with Ren Ci Hospital on 20 April 2017 to interact with patients and engage them through games and art and craft in order to learn more about patients who require palliative care.